All of our workshops can be done as a private or group lesson. incredible space is an experience truly like no other! Time and content can be tailored to your group. 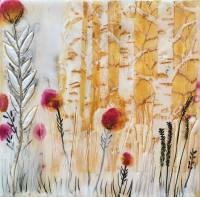 Email the artist to request your personal encaustic workshop. If you are an instructor looking for a workshop space, contact us to arrange your own workshop in our studio space. 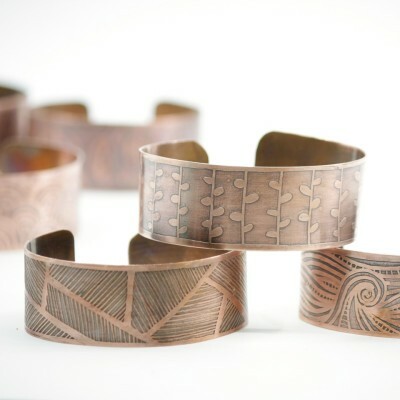 Make a beautiful etched copper cuff bracelet! Explore drawing, etching, 'patinaing', and metal forming. 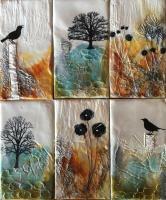 Come and try your hand at Encaustic Art! 30 minutes for $25. You will experiment with layering the wax, fusing with heat, and how to build colour and depth through embedding and mark making techniques. No experience necessary. No need to book ahead. Check our Calendar for available dates. 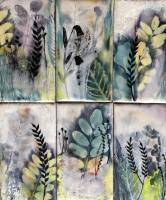 Simply buzz into The Hive Encaustic Studio (Studio 201) and Give it a Whirl. No instruction is given, previous encaustic experience required. Bring your own substrates. $20 per person per hour, after that $5 every 15 minutes. First come, first served or email artist in studio to reserve your spot. Check our Calendar for available dates. 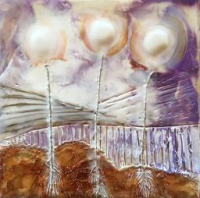 This Hands-on comprehensive 3 hour workshop will cover basic encaustic safety and general information. Learn to mix your own medium and paint pallet. Participants will be able to experiment with techniques such as glazing, sculpting, fusing, photo encaustic, photo transfers, collage, stenciling, stamping. 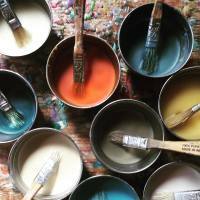 All participants will take home a Introduction to Encaustic Painting Booklet and multiple practice boards. All electrical equipment,wax and supplies are provided. NO previous painting experience necessary. This workshop will cover basic safety and general information needed to begin exploring encaustics. Participants will learn and play with layering and fusing the wax, creating texture through gouging and mark making techniques, how to embed materials, basic photo transfers, and use of the hot stylus tool. 5 Hour Encaustic further explores the techniques in Introduction to Encaustic, as well as stencilling, pan pastels, and india ink. Each participant will leave with their own finished 6x6 birch panel as well as several mat board practice pieces. Explore the luminous, versatile and limitless possibilities of encaustic in combination with photography and mixed media. The workshop is a basic course covering mixed media collage using your own precious photo printed on handmade paper, applying melted beeswax and resin, and exploring techniques in colour and texture. Participants will take home a finished 8x10 mixed media piece. 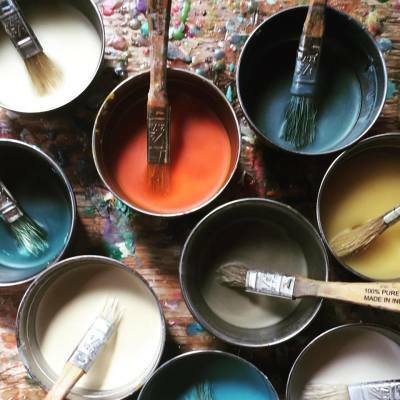 This 2 hour workshop for youth ages 12-17, will explore the creative process through a variety of encaustic and mixed media techniques. Suitable for all levels. Create a one of a kind Keepsake box. A wonderful gift idea or a special treat for yourself. stencils, collage and much more!! 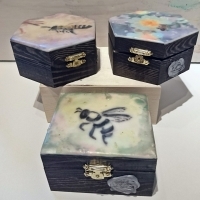 Participants will take home a finished mixed media keepsake box. We are all born to Create!! Imagine what it feels like to just play with paint and colour. Letting go of preconceived ideas and expectations. Being open to what emerges! Bringing balance back into your life! Then let the wax and paint guide your creations! That is where the MAGIC is! 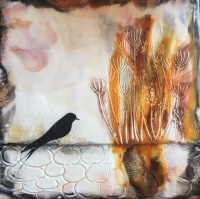 The focus of this class is on process rather than technique and is open to those who have taken a workshop with myself, Karen Brown, or at The Hive in the past, or for those who are experienced encaustic painters. All supplies and equipment included, but please bring your own substrates(maximum size of 16x20). learn new techniques and apply to a home or studio practice. Students will learn to create texture by some of the following techniques : masking off areas, stencils, water on wax, dry brush (accretion), incising, collage items to create texture, iron as a gouging tool, heating tools to create texture. Previous encaustic experience necessary. All electrical equipment,wax and supplies are provided. Student may bring their own works in progress or substrates to work on if desired. In this 3 hour workshop we will discover the joy of painting with beeswax by first learning how to build up layers of wax with a number of painting techniques, and how to fuse together each layer with a variety of heat sources. We will explore a number of painting techniques, such as dripping and splattering the wax, how to make smooth and textured surfaces, how to embed objects in the wax, and how to add texture through a variety of gouging and imprinting techniques. We will then go on to play with mixed media and encaustics. Space is limited to 6 participants. Support workers are welcome. The Hive, Wednesday February 13th, 1-4pm $75 *Passport friendly. Students will learn techniques using fire as a tool!!! Some of the following techniques will be covered: dry and wet shellac burn, pyrography, water on wax, using items to scorch substrates, using the torch as a blending tool. No artistic experience required. All supplies included.